Cobia: Is a spring species that migrates through Florida. Most Catches are over twenty pounds and it is not uncommon to catch fish over fifty pounds. They spawn in spring and early summer. 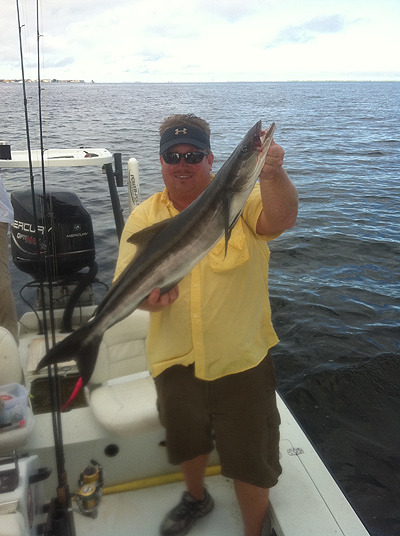 Live crabs and small fish are good baits for cobia. Keep bait near the surface or, if cobia are deeper, add just enough weight to get the bait down and still retain its movement. Medium to heavy tackle is required to land these fish which average 30 pounds. Large specimens in the 50-80 pound class are frequently caught and cherished by the lucky angler who outmatches these powerful fish. Cobia are excellent table fare.